Mark Lynch will make his first Derry start of 2017 as Derry wrap up their McKenna Cup group games with a home tie against Queen’s University on Wednesday (8.00pm). The Banagher player is one of seven changes from the team that started against Down in Pairc Esler on Sunday as young Magherafelt keeper Conor McLarnon joins Ciaran Mullan, Michael Warnock, Conor McAtamney, Enda Lynn and James Kielt in the starting 15. 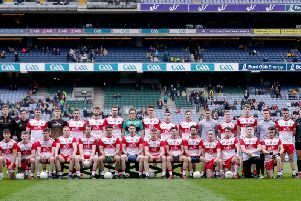 Qualification for the semi-final is out of Derry’s hands after Sunday’s defeat in Newry but should Down lose to old rivals Armagh in the Athletic Grounds and Derry defeat the students, determining the last four will come down to scoring difference between the three counties. 16. Ben McKinless (Ballinderry); 17. Conor McGrogan - Conchúr Mac Gruagáin (Newbridge); 18. Gavin O’Neill (Banagher); 19. Emmett McGuckin (Magherafelt); 20. Benny Heron (Ballinascreen); 21. Carlus McWilliams (Ballinascreen); 22. Patrick Kearney (Swatragh); 23. Mark Craig (Dungiven); 24. Jason Rocks (Loup).